but they also include improved standards that prolong lifespan and overall reliability. Learn how these miniaturization technologies can differentiate your application. How Compact Can a GigE Vision Camera Get? As OEM vendors take on more custom solutions and products, integrating standard industrial machine vision cameras can be a challenge due to space constraints and limited flexibility. For example, when a machine builder needs to add an inspection step in between two wafer production processes, this can become a difficult task. There is limited space in between the production machines thus creating a constraint on the type of camera that can be used. Small space also means short imaging distance and constrained imaging area, creating even more limitation on lens and camera selection. The machine builder is faced with either sourcing expensive custom solutions or engineer their own solution by modifying standard products which increases cost, development time and risk. Use cases like these are common and there has been an increase in market demand for smaller, flexible form factor, and low power cameras that can be integrated into compact machine vision systems. LUCID has integrated different miniaturized technologies to create the world’s smallest GigE Vision PoE camera called Phoenix providing a flexible camera design without sacrificing imaging performance or price. Miniaturization isn’t just about being smaller, it is also about being able to more effectively fit into smaller applications. The Phoenix has a transformable design allowing it to be mounted in a variety of different ways for a diverse range of compact OEM applications. LUCID’s new Phoenix camera provides a fully-featured, micro-compact size measuring only 24 x 24 mm, making it the world’s smallest and lightest GigE Vision PoE camera. But miniaturizing industrial components isn’t just about making them smaller. It is also about making them fit better within the surrounding components, allowing builders to minimize the whole space of the application. To achieve this, the Phoenix has a unique transformable design that can be configured to meet a wide range of OEM designs. The default shape of the Phoenix camera resembles that of a traditional cased camera. However, individual camera board stacks can be unscrewed and unfolded to various angles to best fit the application. For example, it can be used as a 90° angle camera shape for corner mounting or even as a 180° angle shape for the ultimate custom fit which offers broader flexibility in system design. Above: Various Phoenix form factors. Space saving form factors allow for a smaller application size or the ability to place more cameras within the same space. As more features and processing power gets packed into smaller sizes, thermal design becomes imperative. If an effective thermal design is not adopted, smaller cameras might need features removed or have their performance reduced. On the other hand, adding heat sinks along with active air cooling components can easily nullify any space saving gains brought on by a smaller camera. From the beginning, a worry free thermal design was at the forefront of the Phoenix design. The innovative aluminum spacers of the Phoenix not only gives the camera its light weight industrial shape but also allows it to operate at ambient air temperatures of up to 55° C without any additional cooling. When looking at operating temperature specs pay attention to whether the temperature range is measured at ambient or case level. from the camera’s core boards through strategic contact points. Having a high ambient operating temperature enables the camera to perform in more challenging environmental conditions without compromising performance and without the need for heat sinks or additional cooling. Digital CMOS Sensors are not immune to the forces of miniaturization either. The challenge with shrinking sensor sizes is to balance imaging quality and performance with smaller pixel sizes and more megapixels. By adding more megapixels into a smaller space, the pixel size is reduced. The smaller pixel has less area to receive light and this can have a negative impact on image quality. To solve this problem, Sony invented their Pregius line of CMOS global shutter sensors. With each new Pregius generation, Sony makes improvements to their pixel structure, improving the efficiency of the photodiode and reducing noise by optimizing the internal wiring. These improvements allow for smaller sensors with equal or even greater imaging quality than previous generations. For example, in 2014 Sony released their first Pregius sensor, the 2.3 MP IMX174. It was a 1/1.2” sensor with a 13.4mm diagonal size and a 5.86um pixel size. Four years later, Sony released a smaller version, the 2.3MP IMX392. It is a 1/2.3” sensor with a 7.8 diagonal size and a 3.45 µm pixel size. Even though that is over a 40% reduction in size, the imaging quality performance remains the same. The 1st generation 2.3 MP Pregius sensor was 40% larger than the 2nd generation version. 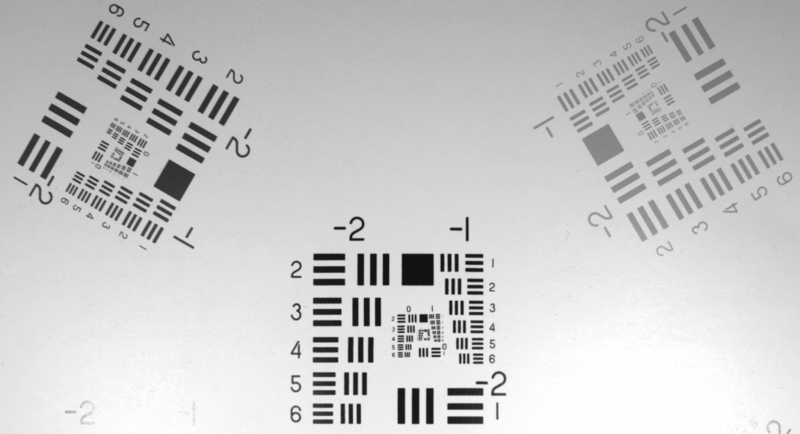 Improvements in miniaturization techniques allows sensor manufacturers to reduce sensor sizes or add more resolution to same size sensor packages. The smaller size allows Sony to pack more sensor dies on their silicon wafers, reducing overall costs through increased yields. 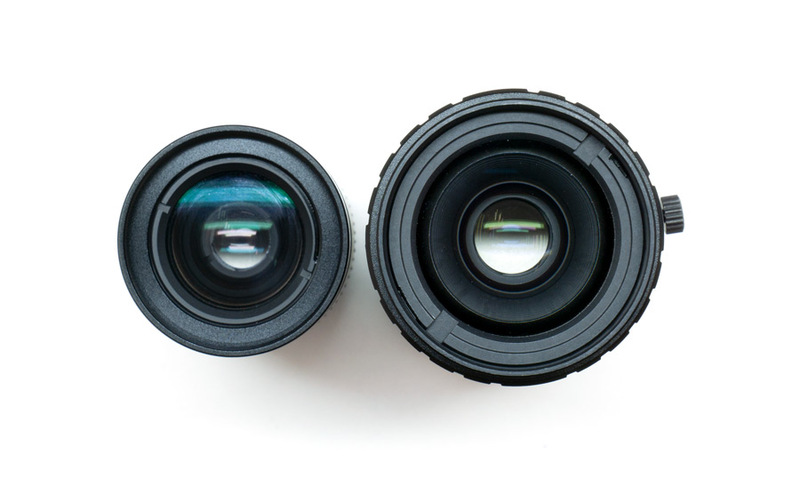 In addition, the smaller sensors allow users to connect smaller, lighter, and more cost-effective lenses such as LUCID’s NF-mount lenses. As resolution of image sensors increases and pixel size decreases, the lens often gets bigger to maintain the same optical performance. 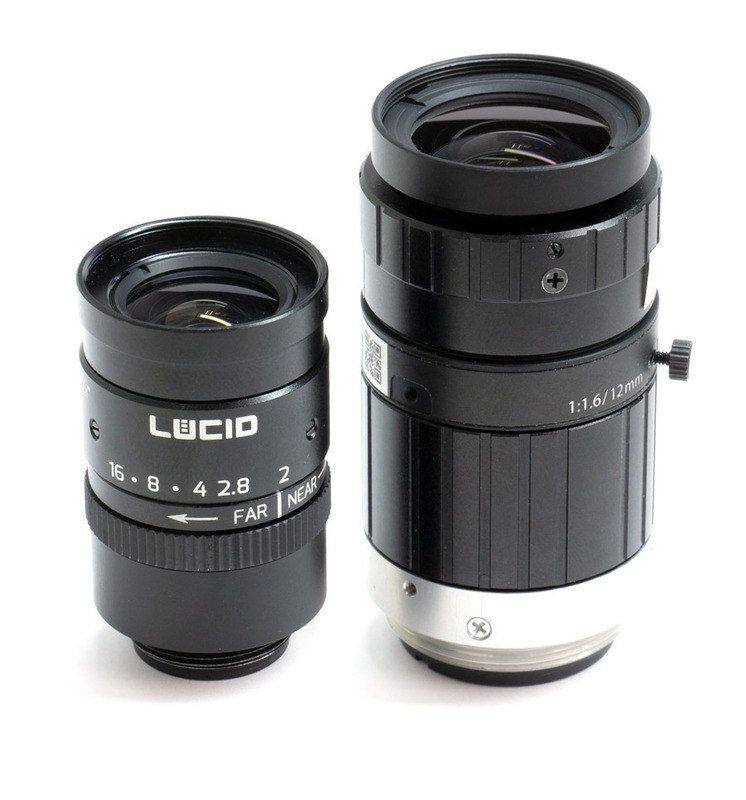 LUCID introduced a new family of 2/3” 5 megapixel rated NF-mount lenses that provide a smaller footprint without sacrificing on performance or price. The lens provides a 40% space reduction and up to 50% weight reduction while maintaining the same imaging performance as a standard C-mount lens. When paired with the Phoenix camera, the overall cross section is within 24 x 24 mm and maintains its compactness. 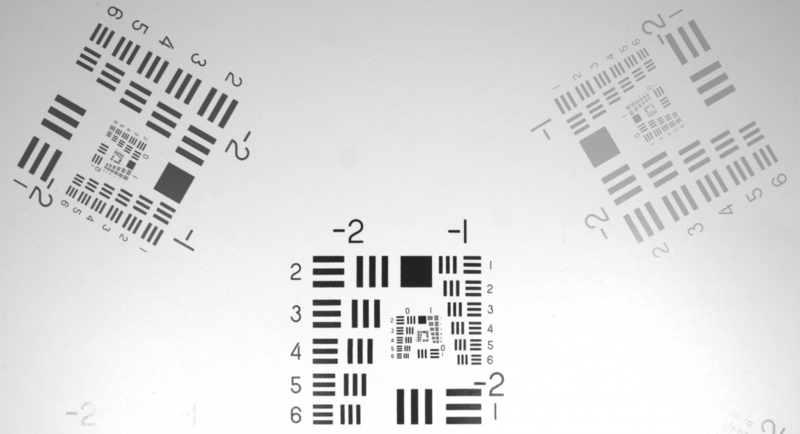 In many cases a machine vision lens is the largest component in a camera setup, out-sizing the camera itself. There is also the misconception that larger lenses always offer better clarity and performance. In some situations this is true but for the LUCID 12mm lens NF-mount lens users can enjoy a large reduction in lens size without sacrificing lens performance. Thanks to Power Over Ethernet (PoE), camera manufacturers can combine both power and data into one single Ethernet cable. PoE removes the need for AC power supplies and separate power cabling. It also increases ease-of-use with the ability to deploy 100 m cable distances without the need for repeaters. PoE modules continue to shrink in size with a 70% reduction over the last couple of years allowing for more compact and convenient PoE devices. Fully compliant PoE IEEE802.3af devices have a maximum power range of 15.4 W ensuring that as more powerful sensors and processors come to market there will be ample power available without the need for additional power supplies and power cables. In addition to a standard RJ45 Ethernet connector configuration, the Phoenix camera optionally offers the new ix Industrial™ connector. 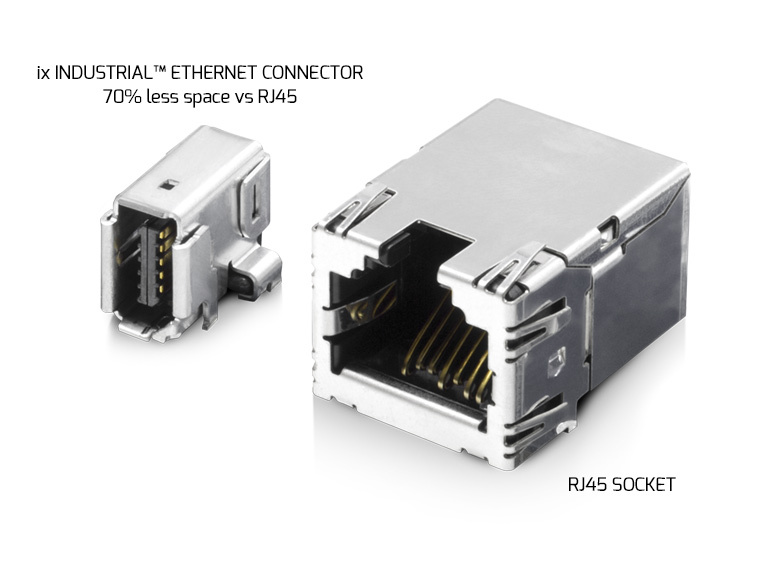 Even though the RJ45 connector is widely used in many Ethernet applications and devices, the size of the socket becomes a roadblock to further miniaturization. The ix Industrial™ connector is 70% smaller than a traditional RJ45 connector, making the Phoenix camera even more compact. This miniaturized connector also offers snap-in positive locking featuring a robust connection design between the jack and the plug using two metal clips. This guarantees a secure and vibration-proof connection of 5000 mating cycles with a locking force of 80 N.
Instead of locking screws on two sides of an RJ45 cable, positive snap-in locks are integrated into the ix connector. Additional reliability is ensured through EMI/ESD prevention and high shock and vibration resistance according to the EN 50155 standard. 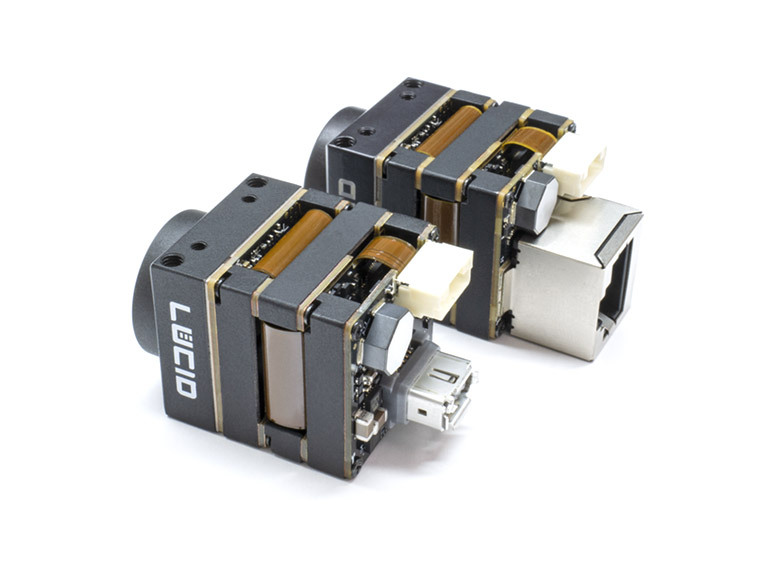 The connector is standardized according to IEC 61076-3-124 and supports all the same electrical parameters used in RJ45 interface. The ix Ethernet connector is rated for a minimum of 5,000 mating cycles. Miniaturization continues to be a relevant and effective strategy for application differentiation. While reducing application size continues to be important for end users, it is also important that ease-of-use, full functionality, and industrial quality also be either maintained or improved. 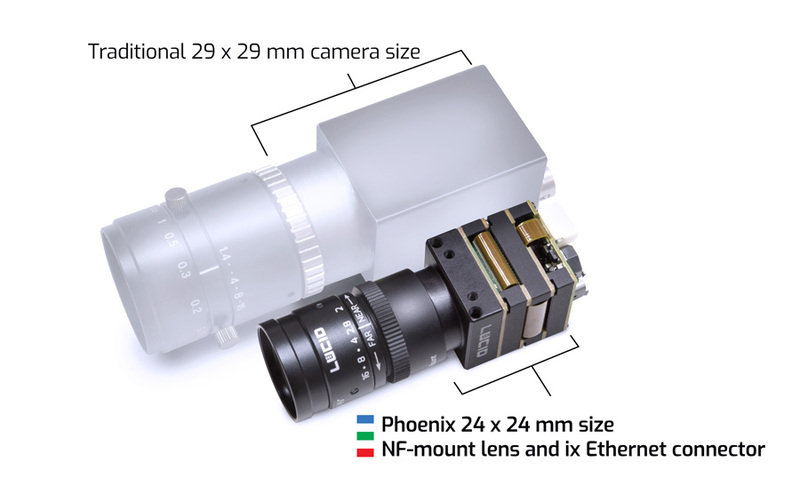 The Phoenix camera employs multiple miniaturization technologies that allow machine builders to reduce their overall footprint without compromising camera features, performance, or reliability.